Today, on the occasion of Ashadhi Ekadashi and Ramadan, it stroke me to give you tip on how to remember that you're fasting. Twice before today, I had used this trick to NOT break the fast; and I'm utterly successful at it. Crazy, but people often forget they're fasting. Just today, my classmate had food stuff that wasn't allowed during fasting; I casually asked him whether he was fasting today, and just then he realized that he had an idli in mouth and said, "Oh damn! I just broke it!" And all the classmates started laughing! Anyway, after reaching college today morning, the first thing I did was writing 'I'm Fasting!' on my palm with a marker so that I don't eat the forbidden food greedily. When we're on fast, we tend to be hungrier than usual days; so the end result is breaking the fast without even its acknowledgment. I always find this trick useful. I don't care if it is a religious thing or no; for example, I don't panic if I break the fast unknowingly as it means I have broken the rules of my religion or culture, but I panic because I feel I couldn't keep myself from not eating the forbidden food items, and that it was one thing I had to do and I couldn't even carry it off. Anyway, even you can write 'I'm Fasting!' on your palms like me. So every time you stretch your arms to take wafers from your friend's tiffin box, or to pay for the forbidden food items, or even simply cook the forbidden food, you'd definitely come across doodles on your palm; and then after seeing them, you'd be like: Oh damn; I was just saved. It has saved me many times. I hope it does to you as well. Regardless of how religious you are, always remember: you're fasting for a reason. (Plus, the food during fast-days is yummier.) So just make sure to follow what you've decided, and be determined enough to follow it all throughout the way. 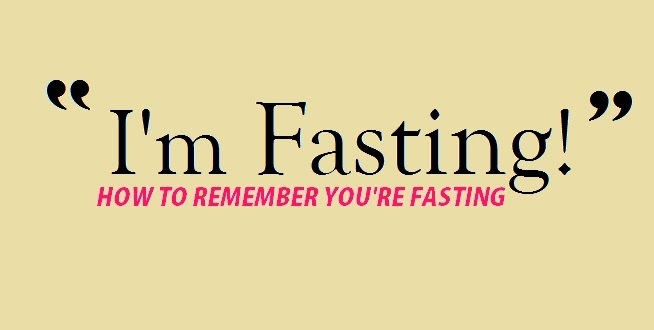 How do you remember you're fasting? Have you broken the fast knowingly or unknowingly anytime?